South Sudan's government has issued an order to non-governmental organisations (NG0s) and private firms to fire certain foreign workers by mid-October. The labour ministry says roles ranging from receptionist to executive director should in future be filled by South Sudanese nationals. The charity Oxfam says the move will have a huge impact on aid programmes. Nearly two million people have fled their homes since two factions of the ruling party fell out in December. Thousands of people have died in the fighting and aid agencies say up to four million people are at risk of food shortages because of the crisis. What started as a political dispute between President Salva Kiir and his former deputy Riek Machar has escalated into ethnic violence. The BBC's Denis Okari in neighbouring Kenya says the move could affect thousands of foreign workers and comes at a critical time for the world's newest nation. "South Sudan is on a knife-edge and could easily tip into famine in 2015 - even though the aid effort here is huge, it is not reaching many of the people who desperately need help," Tariq Riebl, director of Oxfam in South Sudan, told the BBC in a statement. 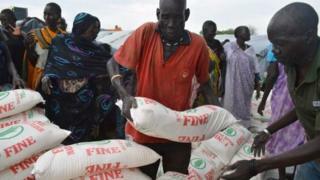 "We need to be expanding aid programmes in South Sudan, not restricting them," he said. "The government of South Sudan and the international community need to work together to ensure that life-saving aid reaches the people who need it." Oxfam said the vast majority of its staff in the country were South Sudanese but there were "many foreigners in key roles". The circular from the ministry of labour lists nine roles - executive directors, personnel managers, secretaries, human relations officers, public relation officers, procurement officers, front desk officers, protocol officers and receptionists - that have to be filled by "competent South Sudanese nationals" from 15 October. Helen Achiro Lotara, the under secretary at the labour ministry, told the BBC the aim was to ensure that 80% of managerial-level positions were held by locals. She said all NGOs and private companies - including hotels and oil firms - should take the order seriously. South Sudan, which gained independence from Sudan in July 2011, is rich in oil, but following decades of civil war it one of the least developed regions on earth.